The U.S. Army Culinary Arts team (USACAT) started successfully into the 2016 Cooking Olympics, winning five medals in the Regional Cold Food Table category: Three gold medals in the culinary arts program, and one gold and one bronze medal in the pastry arts program. 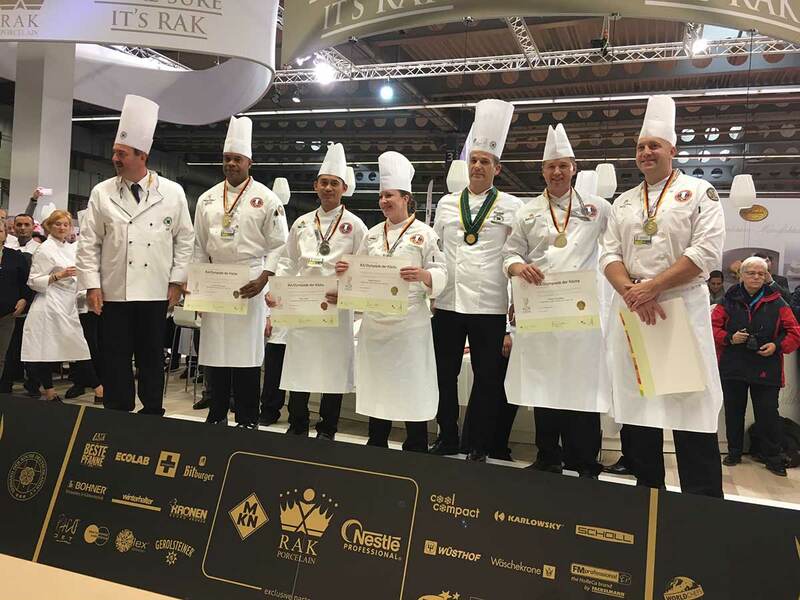 ERFURT, Germany — The U.S. Army Culinary Arts team (USACAT) started successfully into the 2016 Cooking Olympics, winning five medals in the Regional Cold Food Table category: Three gold medals in the culinary arts program, and one gold and one bronze medal in the pastry arts program. “Hard work always pays off and only this group of soldiers knows how much hard work they put in to earn these medals,” said team chief Chief Warrant Officer 3 Jesse D. Ward. Gold medal winners are Master Chief Petty Officer Derrick Davenport, the team’s captain, Staff Sgt. Sarah Perry, Staff Sgt. Justin Gonzalez and Staff Sgt. Kevin Arwood. Staff Sgt. Marc Susa won a bronze medal. Arwood and Susa won their medals in the pastry category. Tomorrow, the team will compete in the community catering category, cooking a warm meal for 150 persons. It consists of soup, salad, one meat, one fish, two veggie, two starches and a dessert. The team from the Joint Culinary Center of Excellence (JCCoE) at Ft. Lee, Virginia, is led by CW3 Jesse D. Ward. Six chefs compete in the Cooking Olympics: Master Chief Petty Officer Derrick Davenport (Team Captain), Staff Sgt. Sarah Perry, Staff Sgt. Kevin Arwood, Staff Sgt. Justin Gonzalez, Staff Sgt. Marc Susa and Staff Sgt. Lagena Bogs. Also part of this year’s team are six apprentices and an operations NCO. Before coming to Erfurt, the team prepared for the competition at the Dragoon Inn dining facility in Rose Barracks, Vilseck, U.S. Army Garrison Bavaria.